THE CITY of Accra, like other conurbations in this country, has undergone lop-sided and uncontrolled expansion and development because laid-down rules and regulations of urban planning were not strictly followed and were even flouted by developers. In many cases, areas set aside for schools, post offices, markets and other social amenities like children's playgrounds and parks were encroached upon. Even streets and waterways were turned into plots of land and rented out to people with the cash to build, quickly. The rule of thumb, it is generally said, is that no matter where a person puts up a structure, if he or she could quickly reach the lintel level, then it could not be demolished. Besides this, other property owners, in pursuit of money, have turned their garages, outhouses and in some cases even toilets and kitchens into sleeping rooms to be rented out. Because of these unchecked developments, the city is now experiencing many problems that could have been avoided. In many parts of Accra, the flooding that occurs during the rainy season is simply due to structures constructed on waterways, and in valleys, thus preventing run-offs when it rains. Meanwhile, every single one of those buildings has a permit ostensibly issued by the city authorities! It would seem as if nothing like town and country planning departments exist, although the taxpayer's money is spent on such departments. The Chronicle realizes that in most cases, the harm has already been done and rectifying the problem now would probably be counter-productive. However, we agree with the city authorities that in so long as two wrongs don't make a right, enough is enough and that the time has come for a stringent application of the law. This is true in the matter of the Dansoman roundabout where the Accra Metropolitan Assembly (AMA) has decided to rid the place of all unauthorized structures before it is too late. 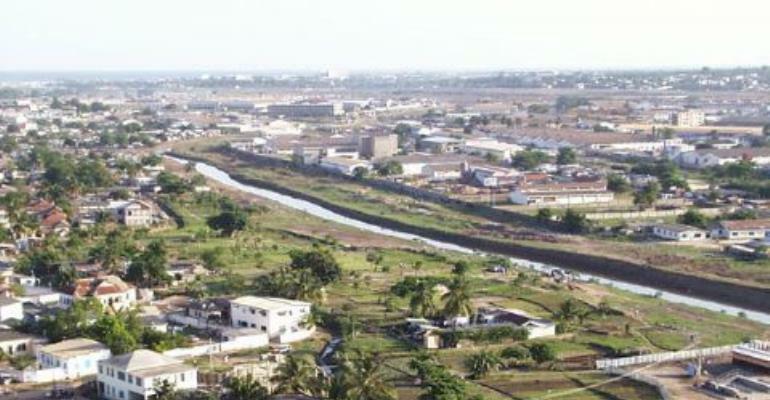 Dansoman is one of the few remaining planned areas in Accra where thankfully, things have not been allowed to get out of control. However, if something is not done to maintain standards, that area too will be turned into a slum. Indeed, the rate of deterioration suggests that, even fancy areas like East Legon will soon degenerate into nothing but glorified slums with little or no social amenities. In the case of Dansoman, owners of illegal commercial structures argue that the properly- designed market is not adequately patronized by customers and this is why they have set up shops on the roundabout and along some of the main streets. The Chronicle, however, sees this as a rather baseless argument that must not be countenanced by the city authorities. We recall that when the Agbogbloshie market and the Makola Shopping Mall were opened for business, the traders screamed blue murder and refused to open shops and stalls they had paid for because customers were not patronizing them. Barely three years on, these properly- designed and planned commercial centers are booming with business. As a matter of fact they are so successful that prices for shop-rentals have more or less quadrupled. The shop owners now smile all the way to the bank! The AMA should, The Chronicle insists, bring some sanity into city planning so that the ever-growing city of Accra can be properly managed. The disgusting scenes in Central Accra where hawkers have literally taken over the streets should be enough to remind all of us that if we do not put our foot down, things will degenerate into chaos. Accra has been allowed to deteriorate for far too long and the situation should not be left to get out of hand much further, unless we wish this city to be just a huge and sprawling slum where everybody does what he or she wants.